Representing the wealth of knowledge, craftsmanship and technical expertise honed through more than 260 years of history is Vacheron Constantin’s Historiques collection. For almost 20 years, the collection has brought back to the spotlight storied icons from the brand’s heritage. They are now updated with modern face lifts, making them once again covet-worthy and relevant to today’s connoisseurs of fine watchmaking. Among the five new models that Vacheron Constantin just added to the Historiques collection is the new Historiques American 1921 small model, presented in the emblematic cushion-shaped American 1921 case. Interpreted in 5N pink gold and offered in a 36.5mm diameter, the smallest case variation that has ever graced the collection yet, its elegant proportions is perfect for ladies. It also comes with a second red alligator shiny leather strap to deliver that extra style punch needed for special occasions. Inspired by the Roaring Twenties, the watch’s signature and beloved features — diagonal display and an off centered crown between 1 and 2 o’clock — are retained. At the heart of this watch beats the 4400 AS manual-winding calibre that drives the hours, minutes and small seconds, while ensuring that time is kept reliably across the 65-hour power reserve. A sapphire caseback offers a peek into the movement and its hand crafted finishing. The other four new models added to the Historiques collection are the Historiques Triple calendrier 1942 (available in two variants) and the Historiques Triple calendrier 1948 (also offered in two variants), which take their cues from iconic timepieces born in the 1940s. 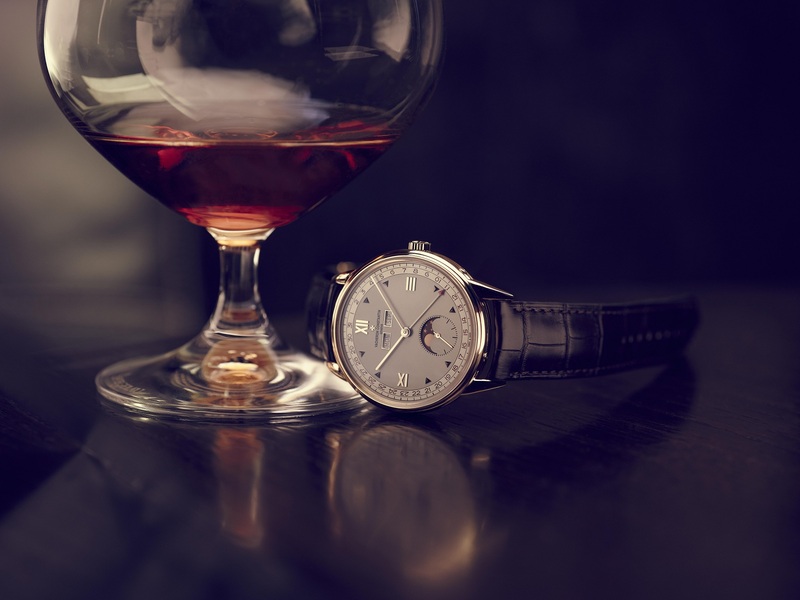 They display features (calendar function, round case with triple gadroons, two-tone dial, “claw-type” lugs and mechanical manual-winding movement) characteristic of watches from that era. Presented in steel, the Historiques Triple calendrier 1942 is inspired by reference 4240 from 1942. Unlike the 4240 that ran on a modified Jaeger-LeCoultre movement, this new model is powered by Vacheron Constantin’s calibre 4400 QC. Featuring the hours, minutes and small seconds at 6 o’clock, the calendar indications (hand-type date and day and month by aperture) are presented in either burgundy or dark blue, on a two-tone silvered dial typical of the era. For something more opulent, the Historiques Triple calendrier 1948 that is inspired by the reference 4240L from 1948, is offered in 4N pink gold (a specific shade of gold that is closer to that found on the original watch). Complementing the time indications and triple calendar indications is the addition of a highly precise lunar cycle. Two limited edition, 200-pieces-only variants, are offered: One with the calendar functions and moon disc in burgundy and the other, with the indications in dark blue.